Blackjack Switch is a very unique, exiting and “deep” variation of blackjack. It was invented only few years ago and therefore not offered by all casinos. Online, there are 2 software providers that offer this game, Playtech and Global Gaming Labs, which is a the one that we will review here and the best option for USA Blackjack Switch game fans. So what’s so special about Switch Blackjack? The unique rule of this game is that you play two hands simultaneously and you can choose to switch the second card between your hands. Naturally, there are some rules that compensate the house for this option. You can find all the rules below and you can also check our main Blackjack Switch rules page. The game is played with 6 decks. Dealer total of 22 will push against any players hand except Blackjack. Dealer will peek for Blackjack with an ace or 10 up. One of the biggest advantages of this game is the low house edge it offers; just 0.34%. It’s not the best blackjack game online, that would be single deck, but it’s very close. 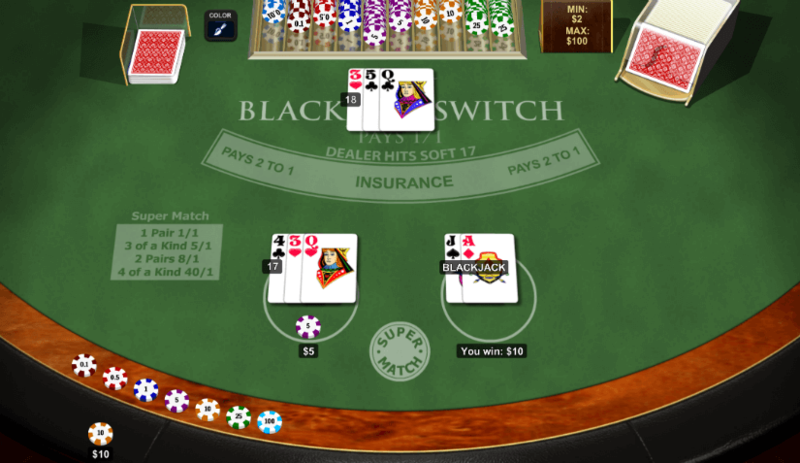 Playtech Blackjack Switch version offers even lower house edge, 0.13%,since players can double on any initial cards. However Playtech’s game is not available to US players. By the way, if you have Switch in your local casino – that’s it probably the best game you can choose. The days that land based casinos offered single deck or double deck games with reasonable rules are long gone (or can be found only in High Roller tables), therefore Blackjack Switch is the most favorable choice in terms of payouts and bet limits. If you wish to play Blackjack Switch for real money, the best casino would be BetOnline (if you are from US), or BET 365 Casino (CA, UK, NZ, EU).